We’re getting close to the time of year when we can put away the snow shovels and snow blowers. Or, were you one of the lucky ones who enjoyed the services of a radiant heated driveway this year? 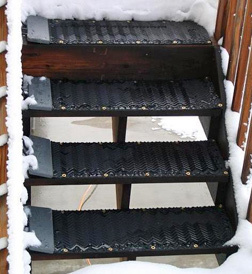 Electric snow melting systems have proven their value in cold climates throughout the country, particularly during the brutal winter of 2009-2010. Designed for convenience and rugged reliability, these automated snowmelt systems lie in wait to ambush the white flakes as they silently descend from the gloomy sky. Okay, maybe I’m being a little dramatic and falling into my romance novel writing mode, but you get the point. The system melts the snow before it even has a chance to stick. Heated driveway systems include an aerial or pavement mounted snow sensor that detects the impending snow barrage and signals the control unit, which then sends power to the ClearZone heat cable, heating the driveway. After the storm, the driveway remains warm for a period of time, ensuring that it is clear of ice before it automatically shuts off. More often than not, this all takes place before you’ve even slipped on your Daffy Duck slippers or poured your first cup of Joe. Isn’t technology great? In addition to the convenience (as if that wasn’t enough), heated driveway systems increase the value of your property and are friendly to the environment. Using renewable energy, electric heated driveways eliminate the need for abrasive, and often damaging, snow removal methods as well as the use of harsh snowmelt chemicals that harm nearby grass and other vegetation. So naturally, there’s no salty runoff from your driveway filling your street gutters. Ya gotta love that! ClearZone heat cable is the preeminent snow melting cable on the market, and features the most impressive manufacturer warranty in the industry. Whether embedded in concrete, asphalt or underpavers, ClearZone cable has a proven track record for a wide variety of applications, and is a favorite among contractors and professional builders. It’s no surprise then that it is most commonly chosen by homeowners. 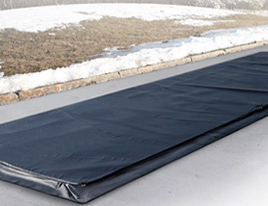 Radiant snowmelt systems have been around a while now but are continually gaining popularity because of their affordability and effective, maintenance-free operation. Homeowners from coast to coast are discovering the many advantages and enhanced safety from installing a radiant heated driveway and/or sidewalk. 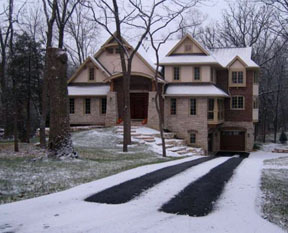 Heated driveways can be customized to fit your driveway surface and shape as well as your budget. While most homeowners install radiant heat throughout their driveway surface, you can also choose more affordable options, such as installing heat cable in tire tracks. Or, simply heat only the areas that you use. Warmzone professionals will evaluate your needs and provide several options and a detailed drawing of your radiant heat system. If you are going down the radiant heat road, make sure you deal with respected industry leaders who will guide you along the way. The silent operation of a radiant floor heating system free from drafts or flying dust particles is why these systems are becoming so popular. Home owners are searching for ways in which they can create a healthier environment to live in. Forced air systems can spread dust, pollen and germs while a radiant floor heating system uses electric resistance cables under the floor or PEX tubing that circulates heated water. Radiant heating systems warm floors to a comfortable level and naturally spreads its heat to objects in the room making your living areas much more enjoyable. Heating your home with radiant heated floors will make breathing easier and not dry you out. Imagine your floors without the need for vents or hot air blowing down from the ceiling. Evenly distributed radiant heat in your floors will allow you to turn down your thermostat two to four degrees. This can reduce energy costs by 10-40 percent and can be verified with your local utility company. This setback to your thermostat can happen because a radiant floor heats from the ground up and delivers the heat through objects not air. This makes the lowest three feet of your home the most comfortable where a forced air system loses its heat to the ceiling and is required to heat from the top down. Delivering heat by air also makes it easy to escape and increase your overall heat loss. A good analogy for radiant floor heating to forced air is a car that has heated seats and a forced air heater/furnace. The forced air in a car can dry you out and can become uncomfortable and is difficult to dial in because of the heat loss due to its air delivery. A heated seat will provide you with quick results and will remain warm long after it is reduced or turned completely off. The heated seat actually warms your body and the car seat, not the air. Forced air will over time will inefficiently heat objects but with the negative side effects of dry air, dust and pollen. If you are interested in discovering your options for a radiant floor heating system call one of our trained representatives at 888.488.9276. Our staff will match your budget to a radiant floor heating system that best meets your heating goals.